Even though I’m not a huge fan of cauliflower, I decided to give this recipe a try and I was not disappointed. The result was a great and satisfying dinner with the right amount of flavor. 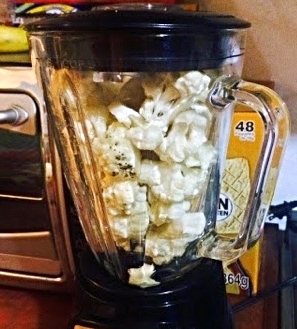 First, place the florets of the cauliflower on the food processor and blend until it gets a couscous consistency. 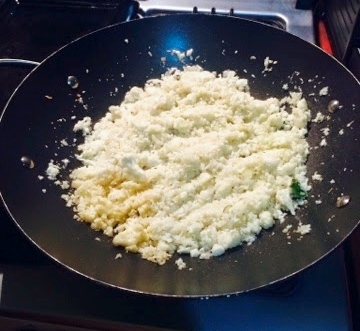 Transfer the cauliflower to an oiled skillet and add the onion, salt, pepper, rosemary and half of your fresh basil. Cook for about 7 minutes. It should smell delicious by now. Transfer to a plate and add the juice of half of lime per plate. 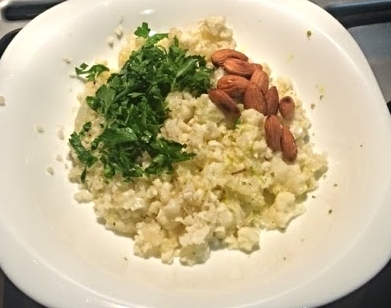 (More if you like) Garnish with more parsley, almonds, and fresh basil. Enjoy!